Last weekend I was at the 2015 Classical Association Conference in Bristol and, after my paper on the sensory experience of dedicating infant votives, I was asked a question about where these votive objects were placed and how were they ‘displayed’. If they were placed on an altar or something similar, I was asked, could they roll off? Unfortunately I wasn’t really able to answer the question very satisfactorily, since very few infant votives – or indeed many Italian votives full stop – are found in their original place of dedication. I could safely say that the relatively flat back of most baby votives, combined with their weight, most probably meant that they couldn’t roll, but it got me thinking: where did people put their offerings and why? 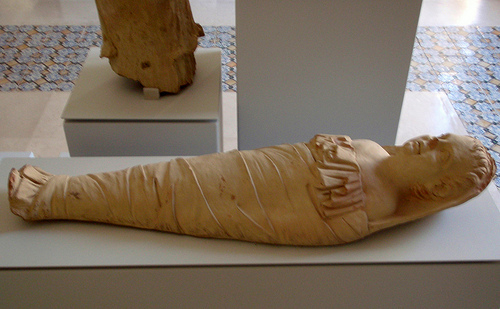 Terracotta swaddled infant from Falerii, lying safely on its back. In some modern settings, such as the Catholic shrines and churches of southern Italy and South America, the public display of votives is really important. These objects, paintings and other dedications are there to be seen by subsequent pilgrims and to testify to the healing or protective powers successfully sought and obtained in that place. Indeed, one of the things that imbues them and the stories and miracles associated with the divine figure with power is their very collectivity. Offerings of all types are curated together as a form of witness to this power. The same was probably true for the ancient world – a build-up of offerings commemorating acts of healing, divine support, successful birth or even just evidence for the ongoing stability of the community via objects which marked key rites of passage such as puberty, marriage and birth, must have acted as visual confirmation of the power of a particular deity in that place. Jörg Rüpke (2007, p. 164) has noted that ‘failed vows produce no votives; the system renders its failures invisible,’ but the reverse holds true as well: a sacred space full of votives renders its success very visible indeed. 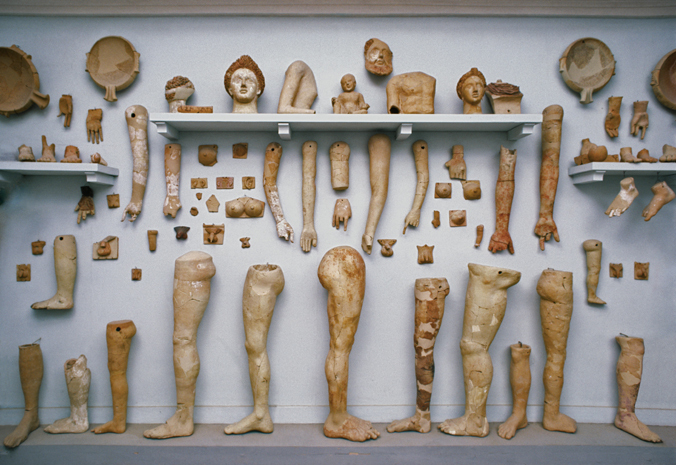 Frustratingly, we know little about what form votive display took for the ancient world. For sites in Italy nearly all votives, with just a few exceptions, are found out of their original context. They may be found within the sacred area (temenos) of the shrine or sanctuary at which they were dedicated, but the majority are not found on the exact spot where they were left by the dedicant (if they were even carefully placed by that person in the first place – perhaps offerings were given to cult officials who were then responsible for arranging them on, near or around the cult statue?). The majority are found buried in pits (sometimes known by modern scholars as favisae, stipes or bothroi) or collected together in another location within the confines of that sacred place. The implications seem to be, then, that if votive objects were ever on public display the expectation was that they would not stay in that place forever, eventually being cleared away to make space for new offerings. There is some evidence for the display of votives in other parts of the ancient world, most notably from Greece. An inventory from the Asclepieion at Athens (IG II2 1534A; see Aleshire 1989; 1991) make it possible to reconstruct what would have been seen by a person entering the temple around the year 275 BC. Objects, including anatomical offerings, plaques (typoi) showing people in the act of worship and coins, were placed on shelves on the wall, laid on the rafters and placed in the hand of the cult statue of the god. The upper parts of the walls were perhaps covered with paintings. Examples of anatomical votives from another Greek site associated with Asclepius at Corinth are pierced by suspension holes which suggest that they were designed to be hung up, from walls or rafters, by leather thongs or cords, whilst others were freestanding or placed up against a wall. Terracotta votives from the Asclepieion at Corinth. But this evidence only takes us so far. The Athenian inventory is unique, and it only records the most precious examples from a single temple. Valuable items made from precious metals, such as gold and silver, were evidently of more interest to the inventory makers (who had an eye on determining the economic value of the temple’s contents) than other items, so who knows what other objects they chose not to record? There is little mention, for example, of cult equipment and painted vases. Sara Aleshire (1991, p. 46) suggests that these were ‘kept routinely in a place which was deemed less vulnerable to theft’ but this, along with the emphasis on the value of other items, reminds us that the inventory may not be as complete as we would like. Indeed, although Aleshire (1991, p. 46) describes the temple as resembling ‘the most jumbled and crowded antique store or museum storeroom that most of us can imagine’ the reconstruction drawing that she provides (Plate 11) is actually remarkably sparse, with the floor left entirely bare and gaps between most of the objects shown adorning the walls and roof space. Similarly, as the only site from Greece known to have substantial numbers of terracotta artefacts we’d be foolish to generalise from Corinth and suggest that all terracotta anatomical votives were designed to dangle from nails even if this is sometimes also the case in the modern world. Holes are certainly known in examples from Italy, but their placement is different – they are more frequently on the back of the object and do not pierce it entirely. Most were more likely to be air vents, designed to prevent these mould-made objects from shattering in the fierce heat of the kiln. 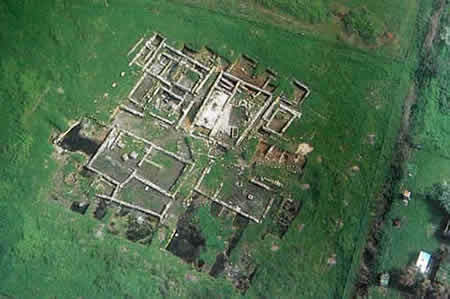 We lack inventories from sacred sites in Italy, a great many of which were small, local and rural, without the level of organisation exhibited by the great Asclepieia of the eastern Mediterranean. Most Italian ex-votos are excavated from unstratified dumps or pits. From this we know that offerings were periodically cleared away, presumably to make way for more, and based on this we might reasonably suppose that sacred areas, perhaps around a cult statue, came to be quite cluttered with gifts making the addition of more problematic. Although, of course, we can’t know this for sure and we can’t even estimate how regularly clearance activities took place. Perhaps there were dates within the religious calendar where this was appropriate, or maybe it was prompted by threats to the security of the sanctuary or other concerns that we haven’t yet thought of. The sanctuary at Gravisca. The infants and wombs were found in one of the rooms (Room M) in the area at the top left. Some sites are a bit different. At Gravisca – the great international sanctuary associated with the port of Tarquinia – there appears to be some evidence for the clustering of ‘types’ within a series of rooms which led Annamaria Comella (1978) to suggest that some spaces were associated with particular deities. All but two of the 28 swaddled infants known from Gravisca were found in one room, along with terracotta wombs and an inscribed bronze vessel dedicated to Hera-Uni the goddess of women and marriage (in her Roman form she was Juno, associated also with fertility and motherhood). Comella suggests that these offerings therefore represent requests associated specifically with reproduction, whereas the 2 infant votives found in the courtyard outside might have been associated with the more general matrimonial and maternal elements of the cult of Aphrodite-Turan known to have been celebrated at the sanctuary. But the subtle differences between these cults elude us and comparable evidence is lacking from other sites. Nor is it clear whether this clustering of offerings represents the original place of dedication or choices made by officials who were clearing items away from elsewhere and who decided, independently of the dedicants, that these types belonged in ‘storage’ together. The plan of the excavated room shows a jumble of objects and reveals little about whether they had once been carefully arranged and whether the room had once been lined with shelves. At less monumental sites we find a different state of affairs. At Fontanile di Legnisina at Vulci, for instance, offerings were placed in a cleft in the face of a cliff, much like a grotto, in front of which stood an enclosure containing a monumental altar (Ricciardi, 1992). Sometime after they were placed in the grotto an earthquake or something similar, caused them to spill out of this cleft covering the area of the altar. It may be that they were placed in the grotto at the moment of dedication, perhaps as part of a cult with chthonic associations, but equally it might be that they were cleared away from the vicinity of the altar to this natural cavity in the rock after a period of time. Perhaps, then, we might think of votive dedication as a two-stage process. At sites where the location of the temple or sanctuary was determined by particular geological features –springs, grottoes – perhaps the ultimate destination was always intended to be that natural context, with the human-made temple or shrine merely a transitional point between the mortal world outside and the divine world which could be accessed via the spring or grotto. A similar argument might be put forward for the secondary collation and sorting of votive objects at Gravisca. 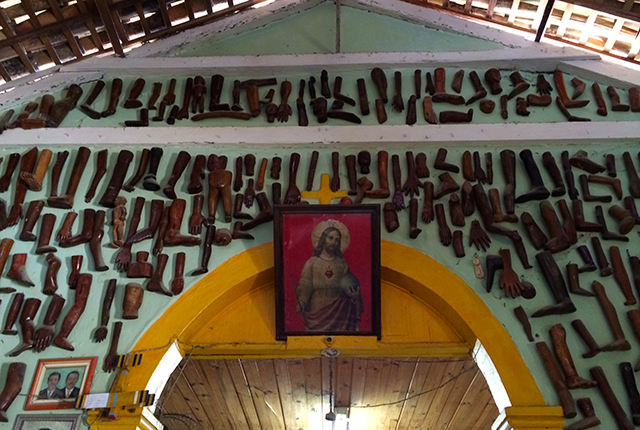 Votive offerings hung on the wall at the shrine of Santa Quitéria das Frexeiras, Brazil. Indeed, in some respects this two-stage process is also what we see in the case of modern examples. Ex-votos on display at Catholic shrines, for instance, are not always in their original place of dedication. Those in Naples associated with WWI, that I wrote about in an earlier post, have been gathered together, arranged carefully in creative symmetrical patterns before being placed on display as a curated assemblage of offerings. This is certainly not how they were original dedicated but reflects a later process of decision-making, re-interpretation and display. Similarly, the wooden limbs at the sanctuary of Santa Quitéria das Frexeiras in north-eastern Brazil were not placed high up on the wall by dedicants themselves but were exhibited there later. It is the job of those who oversee and maintain these sacred spaces to make choices about the ‘afterlife’ of these items and their subsequent display or disposal and, as a result, to determine their ability to communicate with pilgrims and onlookers about the divine power associated with that place. Once a dedicant has made their offering, they have relinquished that object to the divine, but also to its new human guardians. Aleshire, S.B., 1989. The Athenian Asklepieion: the people, their dedications, and the inventories. Amsterdam, J.C. Gieben. Aleshire, S.B., 1991. Asklepios at Athens: epigraphic and prosopographic essays on the Athenian healing cults. Amsterdam, J.C. Gieben. Comella, A., 1978. Il materiale votivo tardo di Gravisca. Rome, Giorgio Bretschneider Editore. Ricciardi, L. 1992. Canino (Viterbo) – Il santuario etrusco di Fontanile di Legnisina a Vulci. Relazione delle champagne di scavo 1985 e 1986: l’altare monumentale e il deposito votivo. Notizie degli Scavi di Antichità Series 8, vol. XLII-XLIII (1988-1989), pp. 137-208. Rüpke, J., 2007. Religion of the Romans. Cambridge, Polity Press. At Brauron the items of clothing may have been moved away from the main display when they got tatty – inventories list them as ‘ragged’ (which Mommsen interpreted as ‘rags’, coming up with his ‘dedication of menstrual rags to Artemis’ theory…). There is an interesting case from Penteskouphia, near Corinth, supporting the idea that small, inexpensive offerings may not have been exhibited at all or only for a very short time. Among the terracotta plaques found there, some were painted on both sides but with scenes in a different orientation. In one example, Poseidon is placed vertically on one side while the craftsman scene on the other side is placed horizontally. If the plaque was ever displayed, the more important side would have been that of the god because this is the side where the two holes were positioned correctly, on the edge above his head. The implication is that, as you said, the act of giving counted for much more than how long the offering remained in the sanctuary. Yes Helen, that is a good point and the same may be true of infant swaddling bands if, as I suspect, these pieces of fabric were dedicated alongside infant models. I think we also have to remember all of the other more ephemeral offerings too – food and drink etc. – none of which was designed to last in the way that (we suppose) terracotta and metal was. Thanks very much Gina that is a fascinating example! I had never thought about ‘re-using’ votives in that way. Probably because I work largely with anatomical votives that it is difficult to imagine being reused (not to mention being a sort of inalienable, one-time gift). But if it is the painting itself which is the offering, as much as the plaque on which it is painted then that makes a lot of sense. I shall look up your article now – thank you! This idea of a “two stage process” is really fascinating. Might it imply then that votives found as collections in pits might be in fact be being viewed in situ? Do you know if this possibility has influenced the treatment of particular excavations? Hi Jedediah, that is a good point. I’m not aware of this being considered when excavating any specific site but I’ll keep an eye out for any examples. It does raise the question of whether pits were immediately covered and closed or left open (which also raises the related question of whether displays of offerings were cleared away all at once or more regularly).An open pit full of offerings could have been quite striking!